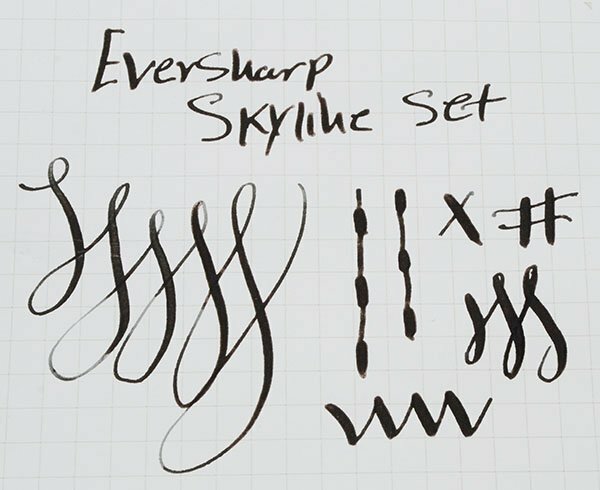 Eversharp Skyline fountain pen and mechanical pencil in the green modern stripe pattern. This celluloid material is often called "moire" by people. 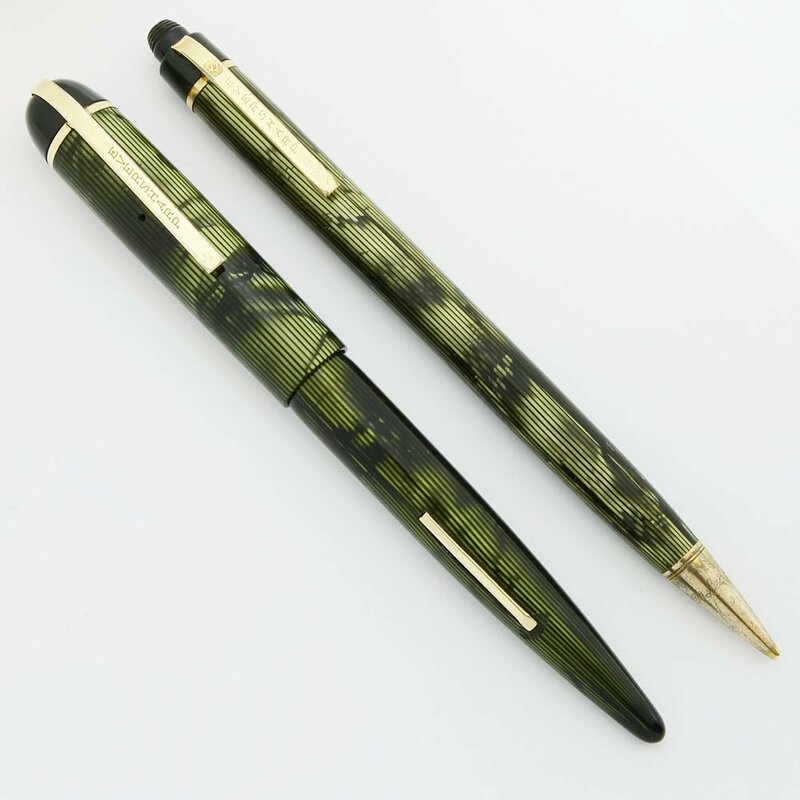 The pen and pencil have gold filled trim with marine green derbies. 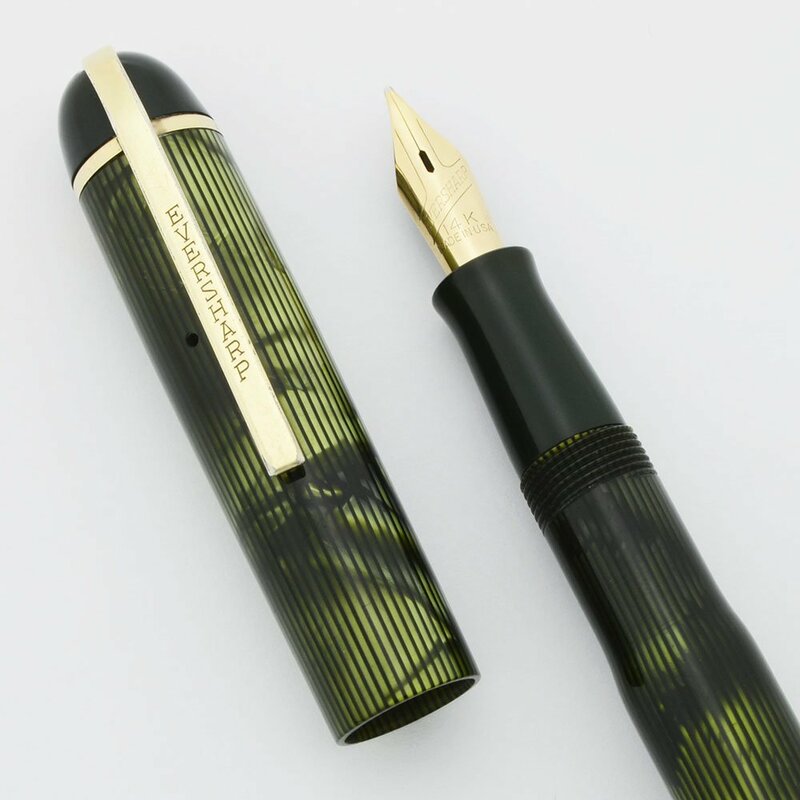 The fountain pen section is also marine green. Since marine green is made of polystyrene, the pen and pencil are a combination of plastic and celluloid. The pen has a wet medium-broad flexible 14k nib and the pencil takes 0.9mm leads. Superior condition set. Both pieces are working well. Length The fountain pen and mechanical pencil both measure 5-1/4". Filling System The fountain pen has a lever filling system. We replaced the sac and it's working well. The pencil has a clicker mechanism to extend and retract the leads. It takes 0.9mm leads. Nib FLEXIBLE MEDIUM-BROAD 14k nib. We consider this almost full flex with very strong line variation. The nib puts down wet lines. It's got tons of tipping and feels smooth. See writing sample below. Condition Superior condition. Both pieces have strong clear patterning and look great in hand. They have low handwear and clear imprints. Both clips have a little plating wear. The pencil cone is quite brassed. No dents, scratches, cracks, chips, or personalization. The fountain pen is fully restored and both pieces are working well.